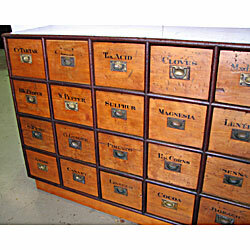 Hoop Pine and Australian Cedar Hand Labelled Shop Drawers, circa 1890. Originally built in as a shop fit-out, this cabinet had been long used as a tool chest and workbench, hence its much abused appearance. A combination of marker pen, paint, engine oil, dirt and grease had accumulated on both the insides and outsides of this cabinet. One drawer was missing, and many others were broken. The cabinet was carefully cleaned to remove adulterants whilst retaining the original surfaces as much as possible. 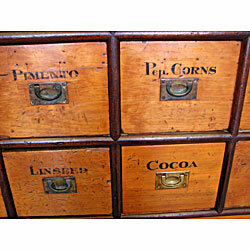 The drawer faces featured original hand painted labels and shellac, these were successfully saved. However, the top had lost all its original finish, so it was only cleaned and its aged appearance kept. The sides and base required some improvisation due to the fact that it had been a built in piece of furniture, therefore a plinth was created in a sympathetic style to the rest of the cabinet. The missing drawer was re-produced and a label painted to match the existing original drawers.